The Miami Marlins head to Citi Field on Sunday, August 20, 2017 to take on the New York Mets. The expected starting pitchers are Adam Conley for the Marlins and Jacob deGrom for the Mets. The odds for this matchup have Miami at +158 and New York at -168. The Marlins have a 61-52-7 over/under mark and a 67-53-0 run line record. The Mets are 50-70-0 against the run line and have a 67-42-11 over/under record. The Marlins have a 59-61 overall record this season. Starting pitcher Adam Conley has a 5-5 record with an earned run average of 5.32 and a WHIP of 1.49. He has 44 strikeouts over his 66 innings pitched and he's given up 71 hits. He allows 9.7 hits per 9 innings and he has a FIP of 4.83. The bullpen has an earned run average of 4.12 and they have given up 420 base hits on the year. Teams are hitting .247 against the bullpen and they've struck out 408 hitters and walked 196 batters. As a team, Miami allows 8.7 hits per nine innings while striking out 7.5 batters per nine innings. They are 18th in the league in team earned run average at 4.51. The Marlins pitchers collectively have given up 1,025 base hits and 533 earned runs. They have allowed 127 home runs this season, ranking them 30th in the league. Miami as a pitching staff has walked 451 batters and struck out 888. They have walked 3.8 men per 9 innings while striking out 7.5 per 9. They have a team WHIP of 1.39 and their FIP as a unit is 4.46. As a team Miami is hitting .265, good for 4th in the league. The Marlins hold a .429 team slugging percentage and an on-base percentage of .328, which is good for 15th in baseball. They rank 6th in MLB with 9.1 hits per game. Marcell Ozuna is hitting .303 with an on-base percentage of .365. He has 138 hits this season in 456 at bats with 91 runs batted in. He has a slugging percentage of .539 and an OPS+ of 136. Giancarlo Stanton is hitting .286 this year and he has an on-base percentage of .379. He has totaled 126 hits and he has driven in 94 men in 441 at bats. His OPS+ is 164 while his slugging percentage is at .642. The Marlins have 1,089 hits, including 200 doubles and 145 home runs. Miami has walked 346 times so far this season and they have struck out 919 times as a unit. They have left 816 men on base and have a team OPS of .757. They score 4.7 runs per contest and have scored a total of 564 runs this year. New York has a 53-67 overall mark this year. With an earned run average of 3.35, Jacob deGrom has a 13-6 record and a 1.16 WHIP. He has 183 strikeouts over the 158.2 innings he's pitched. He's also given up 136 hits. He allows 7.7 hits per nine innings and his FIP stands at 3.66. The bullpen has an earned run average of 4.53 and they have given up 416 base hits on the year. Teams are hitting .256 against the Mets bullpen. Their relievers have struck out 447 batters and walked 183 opposing hitters. As a team, New York allows 9.6 hits per nine innings while striking out 8.8 batters per nine innings. They are 27th in the league in team earned run average at 4.88. The Mets pitchers as a team have surrendered 1,136 base knocks and 580 earned runs this season. They have given up 170 home runs this year, which ranks 6th in Major League Baseball. New York as a staff has walked 427 hitters and struck out 1,043 batters. They give up a walk 3.6 times per 9 innings while they strike out 8.8 per 9. Their team WHIP is 1.46 while their FIP as a staff is 4.57. As a team, they are batting .247, good for 21st in the league. The Mets hold a .440 team slugging percentage and an on-base percentage of .315, which is good for 23rd in baseball. They rank 22nd in MLB with 8.5 hits per contest. Jay Bruce comes into this matchup batting .267 with an OBP of .334. He has 117 hits this year along with 86 RBI in 438 AB's. He maintains a slugging percentage of .541 with an OPS+ of 124. 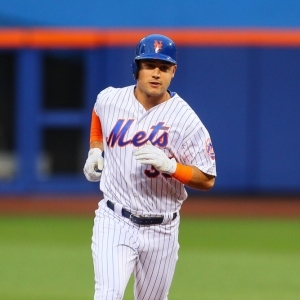 Michael Conforto is hitting .278 this season and he has an OBP of .385. He has collected 99 hits in 356 at bats while driving in 64 runs. He has an OPS+ of 144 and a slugging percentage of .559. The Mets as a unit have 1,015 base hits, including 209 doubles and 180 homers. New York has walked 378 times this year and they have struck out on 957 occasions. They have had 787 men left on base and have an OPS of .755. They have scored 4.64 runs per game and totaled 557 runs this season. Who will win tonight's Marlins/Mets MLB game against the spread?